This essay originally appeared at Westeros.org, in “Pawn to Player: Rethinking Sansa XXI” and was co-written by Westeros contributor and PtP co-host Milady of York. Or is it? We now present our favorite theory about what happened to Sandor’s discarded and bloodied Kingsguard cloak, as inspired by earlier work for PtP. It’s to be noted that the colour of this cloak isn’t mentioned at all, though we can speculate that it could’ve been crimson, for two reasons: Sandor is a Lannister man whose liege lady is Cersei, and the Lannister guards and men-at-arms wear crimson cloaks as a sort of uniform, and also because his presenting the cut down body of Mycah to Lord Eddard is reminiscent of Tywin presenting the bodies of the Targaryen babies murdered by Gregor to Robert in a bloodied crimson cloak. This is the only time the colour of Sandor’s cloak is noted, other than the Kingsguard white, and in contrast to the white and the red which are like uniforms, this appears to be his own personal garment. She found his cloak on the floor, twisted up tight, the white wool stained by blood and fire […] She shook out the torn cloak and huddled beneath it on the floor, shivering. In ASoS, as Sansa flees King’s Landing, she dons a deep green cloak with a large hood in the castle godswood to cover the brightness of the pearls on the bodice of her brown dress. 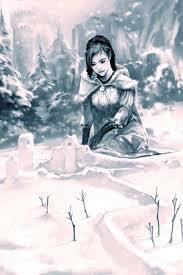 Dress warmly, Ser Dontos had told her, and dress dark. She had no blacks, so she chose a dress of thick brown wool. The bodice was decorated with freshwater pearls, though. The cloak will cover them. The cloak was deep green, with a large hood.
. . . Arya flung the orange across the table. It caught her in the middle of the forehead with a wet squish and plopped down into her lap […] The blood orange had left a blotchy red stain on the silk. Her gown was the ivory silk that the queen had given her, the one Arya had ruined, but she’d had them dye it black and you couldn’t see the stain at all. So the brown dress under the remade Kingsguard cloak is a perfect mirror of Sandor’s garb. The fact that she uses the green cloak to shield herself is so symbolically perfect that the conclusion almost writes itself. “See that you bathe and dress as befits my betrothed.” Sandor Clegane stood at his shoulder in a plain brown doublet and green mantle, his burned face hideous in the morning light. Behind them were two knights of the Kingsguard in long white satin cloaks. “If you won’t rise and dress yourself, my Hound will do it for you,” Joffrey said. Sandor Clegane scooped her up around the waist and lifted her off the featherbed as she struggled feebly. Her blanket fell to the floor. Underneath she had only a thin bedgown to cover her nakedness. “Do as you’re bid, child,” Clegane said. “Dress.” He pushed her toward her wardrobe, almost gently. We don’t think it’s an accident that these colours are repeatedly associated with Sandor Clegane. Sansa mirroring Sandor’s colours in her choice of attire during her flight from King’s Landing is, for us, a sign of great significance rather than random chance. On the matter of the hood, we don’t know for certain that Sandor’s white cloak had a hood or not, but it’s likely that it didn’t since ceremonial cloaks were of the “cape” type and generally didn’t have hoods. 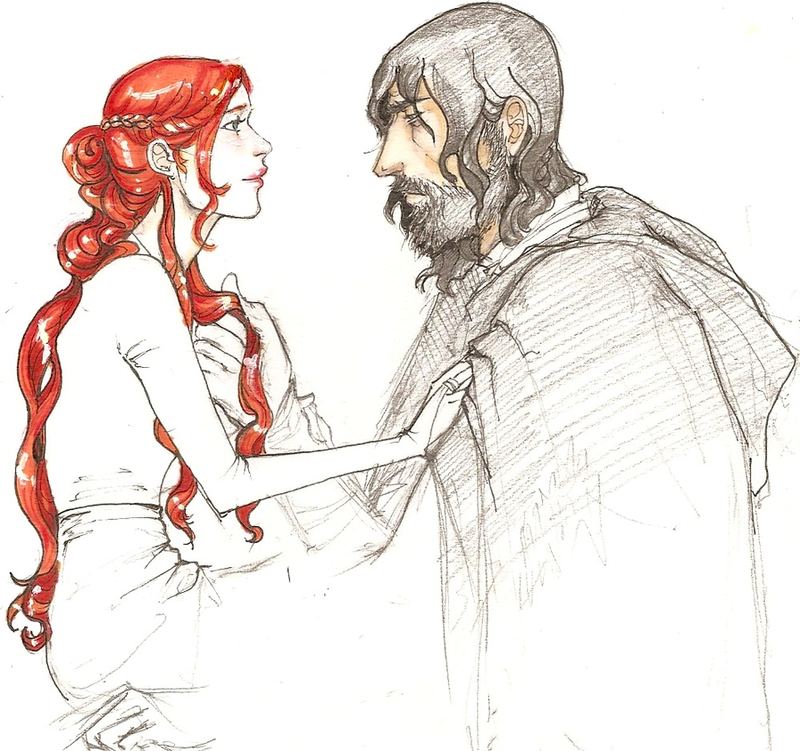 We would suggest that if it did not, although Sandor most likely ripped a strip from the bottom of it to use as a bandage (“Sansa heard cloth ripping…”), we should remember that he stands well over a foot taller than Sansa, so it was a large piece of cloth and it’d be easy for a young lady known to be clever with her needle to cut a cloak down and fashion a hood from the pieces. With the confusion of a team of eighteen seamstresses working in her chambers and the Tyrell girls to provide camouflage, surely at some time during this interval Sansa could have found the means to remake the cloak. One poster even noted that the Tyrell color is green, so how easy to use flattery to obtain the necessary dye to disguise her keepsake! A couple of other interesting notes from the westeros discussion: many posters noted the parallel between Sansa using her needle to create a shield and Arya’s potential use of Needle as self-protection. It was observed by PtP co-host brashcandy that Sansa retained the amethyst hairnet from the Purple Wedding, in the pocket of the green cloak, possibly turning it from shield to weapon (or at the very least, sheath) Finally, yolkboy observed that hoods are used by many characters to conceal their identity. In my essay on Sansa’s Arthurian themes I asserted that Sansa became a Grail Maiden (guardian of Self) for Sandor on the night he left the cloak in her chambers. Also, that as she fled KL she donned the green cloak not only as protection, but as her own symbolic Grail Castle in which to hide her identity. The concept of the Grail Castle as the unconscious where the experience of Self may be discovered is a cornerstone of Jungian interpretation of the myth. We see this borne out in her chapters following the flight, as her true identity is increasingly subject to her assumed identity. How appropriate it will be then if the cloak does become instrumental in her reassertion of her true identity. This indicates to us that she has the cloak still, since she doesn’t mention what became of it nor give any indication that it is lost to her. Since we know that she only took one cloak with her as she fled King’s Landing, we shall now say with confidence, quod erat demonstrandum.